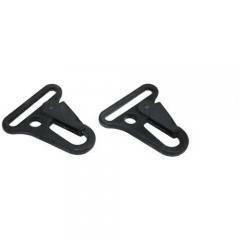 These sturdy one-inch snaphooks from Blackhawk are an essential piece of any rifle sling assembly, allowing you to carry a long gun securely and comfortably. They attach to each end of a two-point sling, and snap on to sling swivel studs to provide a secure fit. Their durable metal construction and heavy-duty design makes them extremely durable, capable of withstanding impacts and shocks as well as the weight of your firearm. The snap design prevents them from disengaging by accident, so you don't have to worry about your rifle sling suddenly coming loose.